I saw this photo which I took during our recent Boracay trip on my laptop album and it made me think… This kind of reminder should not be taken lightly. I say this because I remember noticing a passenger who got annoyed when a Flight Attendant asked him to fasten his seat belt. The seat belt is there specifically to secure and protect you should any emergency situation arise. 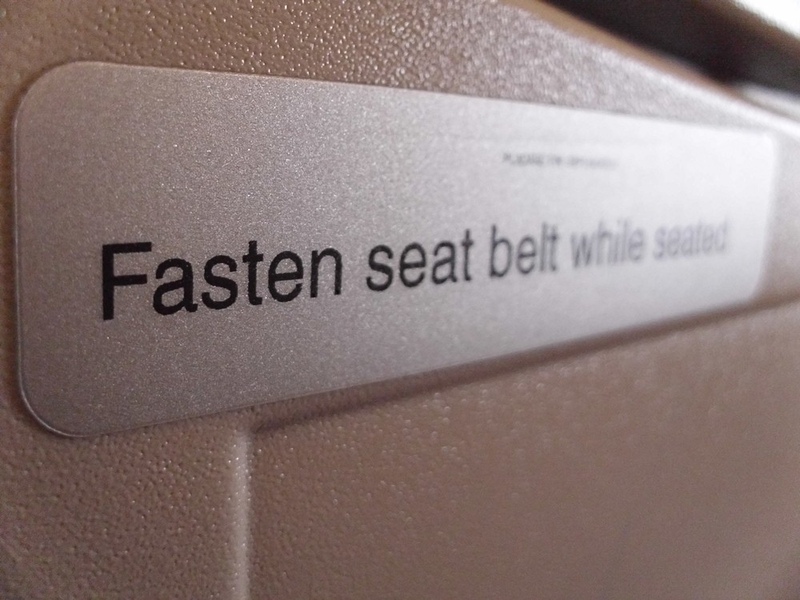 Even when the seat belt sign is off, it is still advisable to keep your seat belt fastened – unless, of course, you need to go to the lavatory. From 1981 through 1997 there were 342 reports of turbulence affecting major air carriers. Three passengers died, two of these fatalities were not wearing their seat belt while the sign was on. 80 suffered serious injuries, 73 of these passengers were also not wearing their seat belts. Remember, the seat belt is not there for aesthetics… It was placed there for a reason – to save your life. You are Here >> Home » Tips » Fasten your seat belt!